www.paris-anglo.com/housing/guide/housing_word.htmlMight be worth checking the Fusac site. Fusac is a free magazine mostly for the ex-pat community. Great for buying second hand furniture etc, but apartments will be expensive, because most will be short-term. You pay the insurance on the Flat. The difference between furnished and unfurnished is pretty big. In general it is more than 250 euros per month for a 1000 euro flat. The notice period is 3 months, for an unfurnished flat. 1 month for furnished (I think). You pay the agency fees, all of them. These vary. Can be up to 12% of 1 years rent. For unfurnished the standard contract period is 3 years. For furnished the standard contract period is 1 year. You can escape your contract without penalty if you leave the country. You must have a bank account. Can be awkward, as you need an address before you can have a bank account. www.mooseheadparis.comArrondisementsGet used to the Arrondisement (district) numbers. It?s like a snail; the 1st is the very centre of Paris.And it winds out in a spiral to the 20th.Good areas are the 1st, 2nd, 3rd, 5th, 6th, 7th, 8th, 11th, 15th. Though of course not the whole of them, they have their bad and their good parts.However, the 16th and 17th are only good if you happen to like little old ladies wearing fur and dragging ratty little dogs around (you know, the types with tartan jackets and yap lots, constitute a light bite for a proper dog).The best areas that you are likely to be able to afford are 3rd, 5th, 6th and 11th. Families might prefer the 15th The 5/6th is the Latin quarter. It is probably the liveliest part of town, it doesn't have a bad part.Lastly: Think about buying. The loan rates are pretty reasonable. The housing costs are much cheaper on the purchase side than on the renting side. You can get English speaking notaries to make life easier for you? Down side. Even after you find a place, it will be 3 months minimum before all the paperwork is sorted out. It has been a long time we were exchanging e-mails and phone calls with Ritu, but could not meet her in-person. She is a friend of Akiko's Paris friend. A long chain; but a start to make social contacts in new place. I am personally not that social to make friends at party or other social gatherings that is one reason holding me to join local Expats club.Ritu arranged a great picnic and was very nice to meet all other expaticians. It was great day and we had lots of food and fun. It was a very beautiful park in 19th arrondisement infact, place for newly wedded couples to take their wedding pictures. 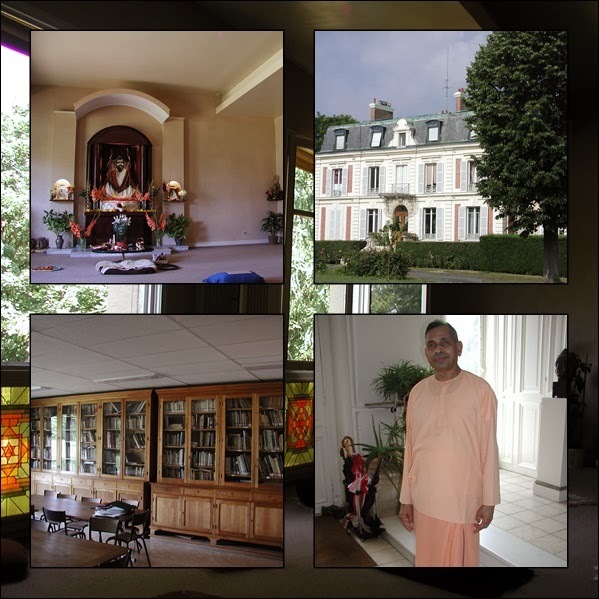 Ramkrishana Mission or center of Vendantic Society as we know it, commonly is situated out side of Paris. A great place just to go and spend some time in peace. It was birth anniversary of Ramkrishana when we went there first time. We were very unsure how to reach the Center. But it was a miracle we found some one speaking English at the station to guide us. This center is quite big area-wise compared to San Francisco and Berkeley one that we visited. If you are interested, please check their web page for the same.http://perso.wanadoo.fr/centre.vedantique/We met some nice families of our mother tongue. They are living here for quite a long time, more then 30+ years which was big shock to us. I am not yet in love with the idea that I really want to live here for long or not. But it was nice to know some people. OK, we moved to our own apartment after all. This whole week was very busy and hectic.Monday: It started with getting informed that my checkout from hotel was the very same day. But I was not informed about this before. And hotel people informed Pamela and disconnected telephone; a real mess. We could not connect each other and convey what was happening at two ends. I must have to admit the HR practice is worse here.YES, it is the worst. I didn't have so bad HR even when I was in a contracting company. May be these HR people feel like they have done a great favour by hiring you. So I told I am not going to move out from hotel if needed I will pay from my pocket and wait till the delivery of my shipment from US is done. So after heated arguments they say oh!! No problem how many days you want to stay more ....Tuesday/Wednesday: I took two days off from work. I think I should have given time off to get settle in my apartment. Any way the movers came on time and really worked hard to make the delivery at 3rd floor without lift. I realized the sofa is too.. big for my place and I still wonder how I am going to get rid of this big and heavy stuff. Lots of box to open and arrange and we are trying our best. I must admit Pamela did a great job. In mean time we went to get curtains and other needs from nearby stores.After, all these I still realize the weekends needs lots of work.Weekends, started with Darty - the Electronic super store here to order freeze, washing machine etc and we ended up going to IKEA on Sunday for some small furnitures. First time we went to sign the lease. They asked me to write cheque of almost 3000. Oh! !but I didn't had French cheque book yet & there was no money in the account either. What a shame!!! No one told me. So I went back to work and found I will be paid only once a month here. Need to wait till month end.So after a week I came with the cheques and got the keys of the apartment. 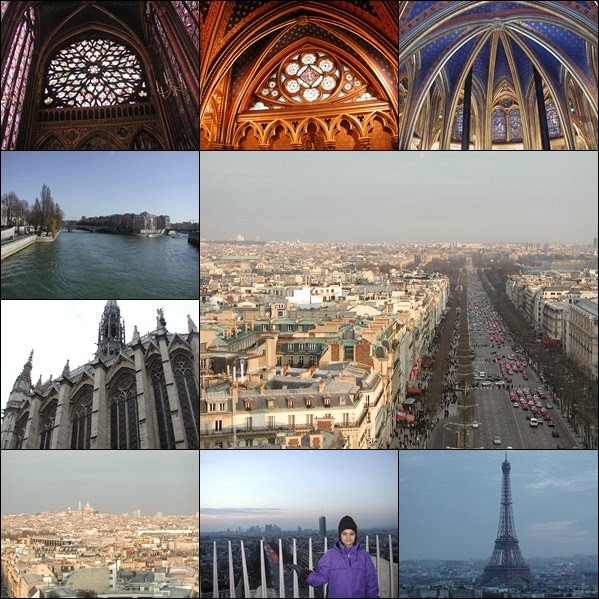 Another nice weekend in the month of March and we are trying to see all the top sights on our guidebook. We must admit this book is indeed a very good and very nice gift from Akiko and others. A highly recommended guidebook on Paris by Avant Guide.This time we started with St. Chappell at Heart of Paris. Wonderful craftsmanship on glass windows, which tells the story of Bible. Next to it is high court of France.On the way back to hotel we got down at Champs-Elysses Etoile. After walking on that famous road we decided to climb all those 200+ circular steps to go to the top of the Arc de Triomphe. It was worth going at top of the arch to have a clear view of 12 roads connecting at that point. We spent a good time finding all other major points which we could figure out from our limited knowledge of Paris.With the dawn,as soon as the lights were lighted on Eiffel Tower it was really looking magnifique. It was a bright and bleak winter day, we headed straight to the number one attraction of Paris or Europe as you might say. A great view; this picture was taken by a Japanese tourist. There were lots of people from Indian sub-continent selling momento of Eiffel Tower for cheap. But we left after a while, as it was too cold and windy that day to go at the top of tower. p.s. Added link for more pictures of this monument for other days. It was now time to find a roof in Paris . But this day was the first day we really went out in Paris. 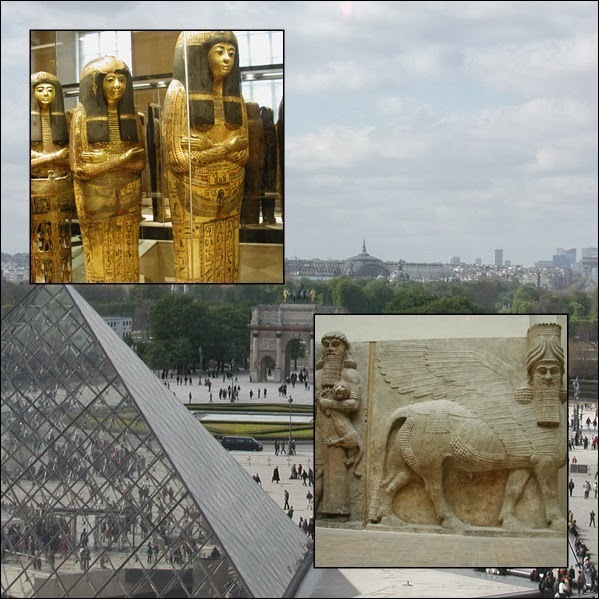 We were only 5 days old in Paris and the relocation lady started with a very very bad apartment and kept on showing till we found a one of our budget with lots of discomfort. however,Pamela was very skeptical about this place but somehow we agreed on this after doing lots of calculations. After getting over with jetlag went to OMI for my medical visit next morning. It was OK. Tried Metro for the first time (Parlez vous Anglais) worked. BTW this medical vist is must before any one starts working in French. But all that good time was so short lived as we reached Cite Police Prefecture. A very big old building in front of Notre Dame in center Paris. This is the H.Q. for all civilian work. So lots of people were in queue. Here no on speaks anything other than French and they are least bothered about what you are trying to say either. After basking last 4 years in Bay Area we moved to Paris. The weather was bleak cold which almost blew me off as we were getting in to the TAXI at the airport. Reached hotel without problem, had a Chinese female driver speaking English. Exhausted and tired to reach work which looked like a 5 minutes walk from hotel on map. But, got lost in concrete jungle of La Defense which is one of the unique place with concentrated modern high-rise buildings in Europe. With out realizing found La Grande Arche which was right in front of my nose. After asking several people and at last police which was no good for me to reach work that evening. 14th Aug’02 traditional ring ceremony gave some consoling. Your father is no more, came a voice grieving.